To make it easier to support the Allegheny Valley Project, we've installed a "Donate" button in the upper right side of the page. The button provides a secure transaction environment powered by PayPal, and you can use most major credit cards or a PayPal account. 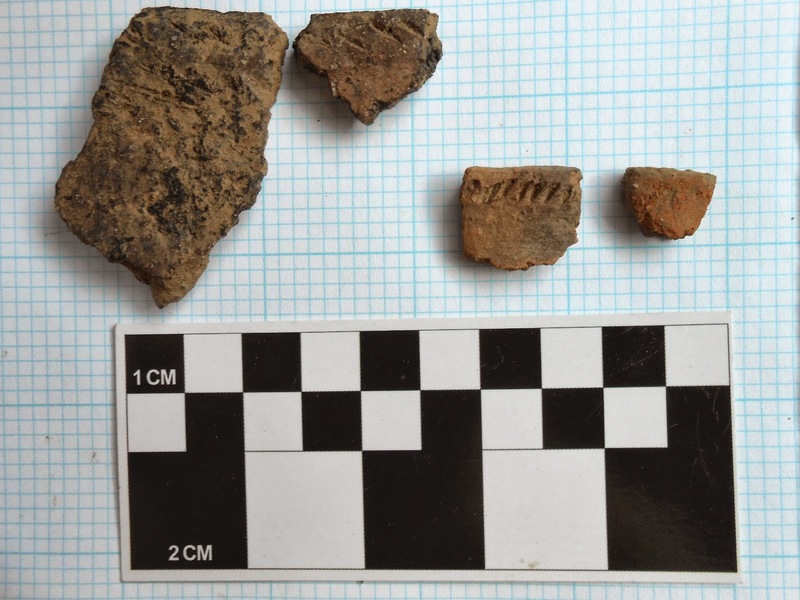 Your donations help us purchase supplies for archaeological activities, pay for research expenses such as radiocarbon dating, and pay for overhead costs involved in day-to-day operations. If your donation is $15 or more, you will be counted as a Supporting Member. Donations of $50 or more will receive an electronic receipt to print out for tax purposes. We welcome business sponsors as well. 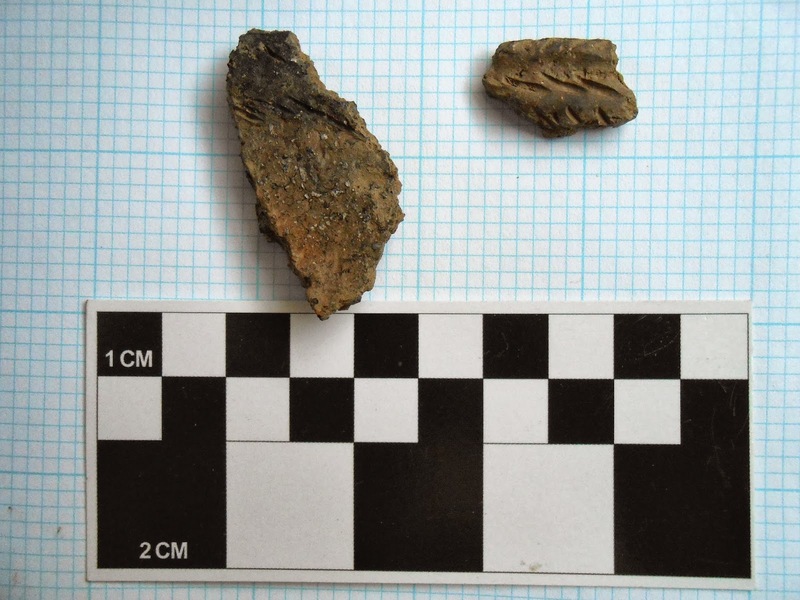 Email us at avp.archaeology@gmail.com with any questions, comments or directions concerning your donation (if you want to fund a particular activity, for example). Ask to be put on our email and/or paper mailing list to receive the AVP newsletter. To all of our current and future Supporting Members: your support is greatly appreciated! Remember, the AVP is a 501(c)3 charitable organization, so your donation is tax deductible. The 2014 field school runs during the second summer session (begins July 14 and runs to August 8), and is worth 3 credit hours at SUNY JCC. The course title is ANT 8509, and the Course Registration Number (CRN) is 4113. 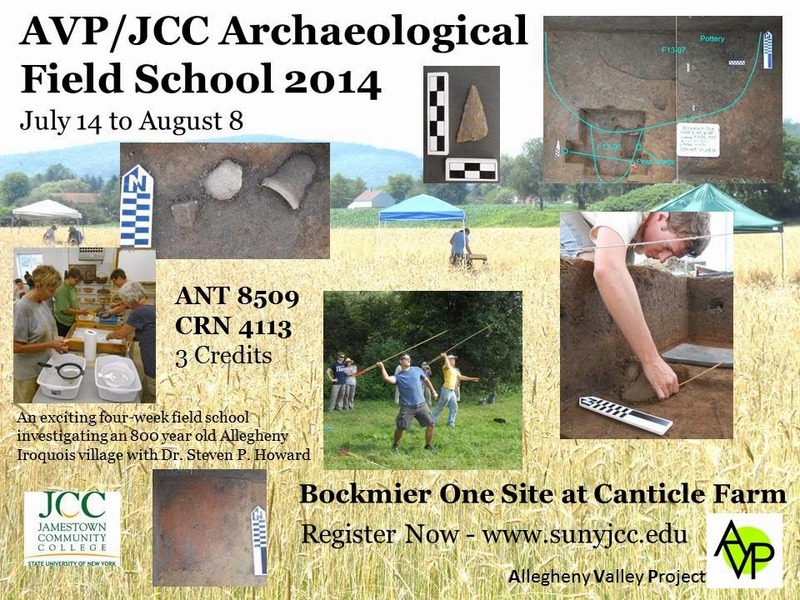 Forms can be found at http://www.sunyjcc.edu/files/registrationforms_summer2014.pdf . Registration is open from January 2 until July 3. Tuition for this year is $528 for NYS residents (be sure to submit the residency form), and $1056 for non-resident students. 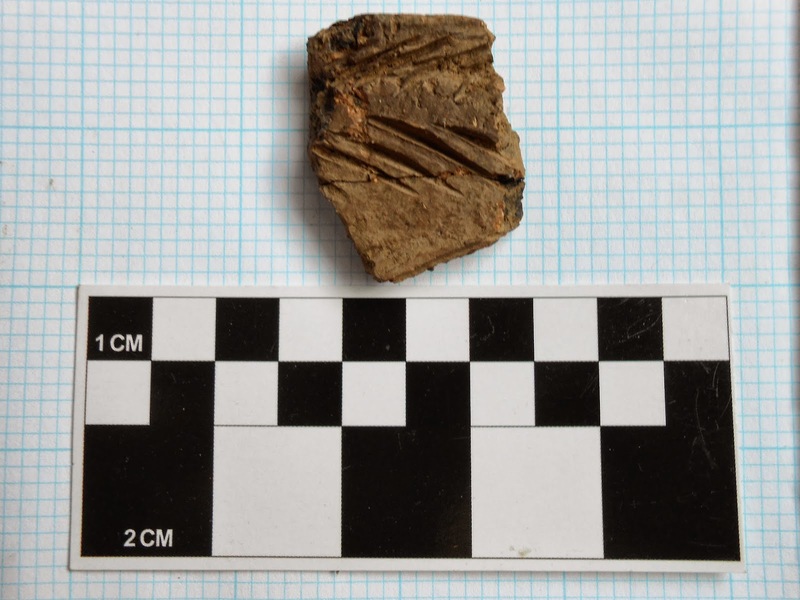 Over 2000 artifacts have been processed from this season, including a few surprises, like pot "A" which was first encountered on the surface more than 10 years ago... Several more fragments were recovered during excavations this year. 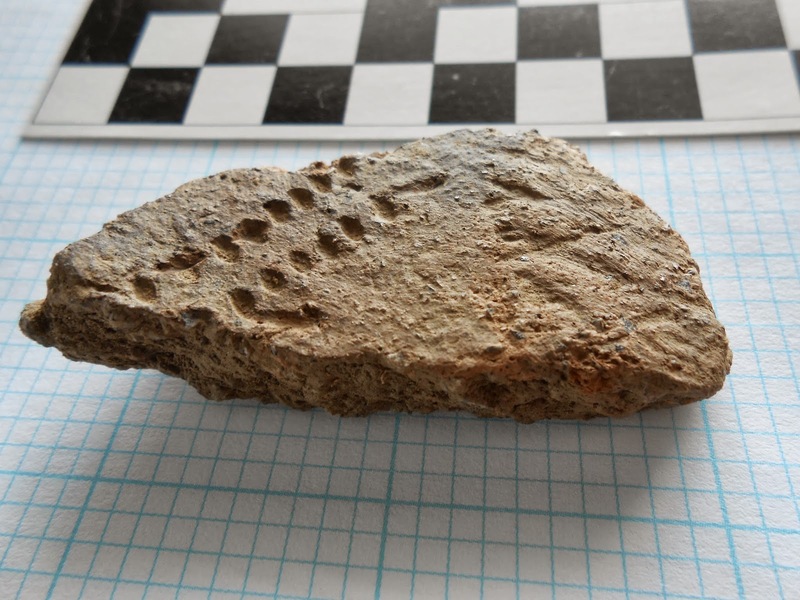 More about this and other artifacts in the newsletter, which will be out later this month. Soil and charcoal samples await processing early next year. Laurie was the screener for most of the the feature processing. 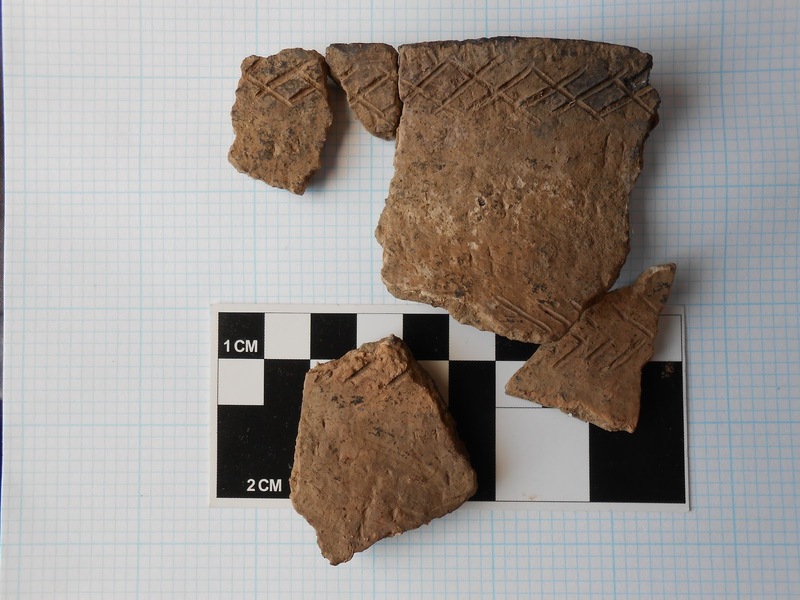 Ryan and Amanda work around some newly emerging pottery fragments. 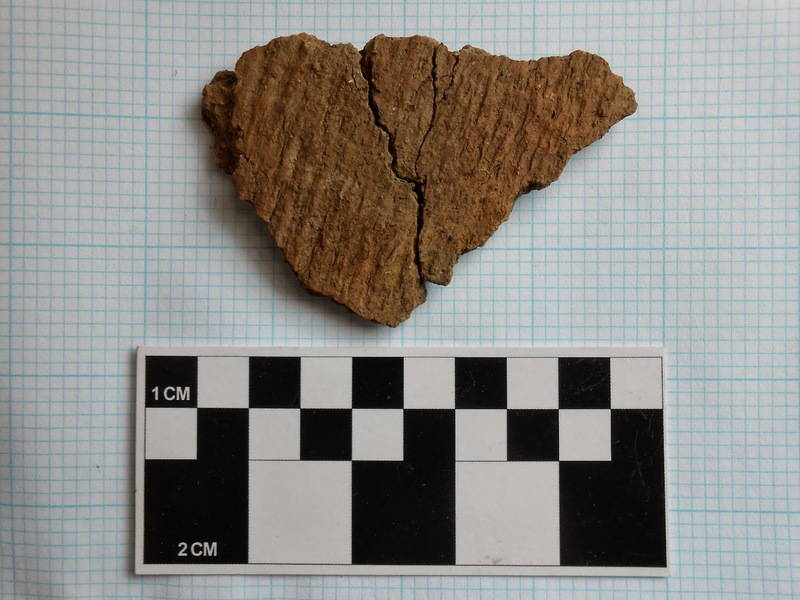 The pottery fragments turned out to be just the tips of a large section of a pot, which Ariel and Tim worked on uncovering. 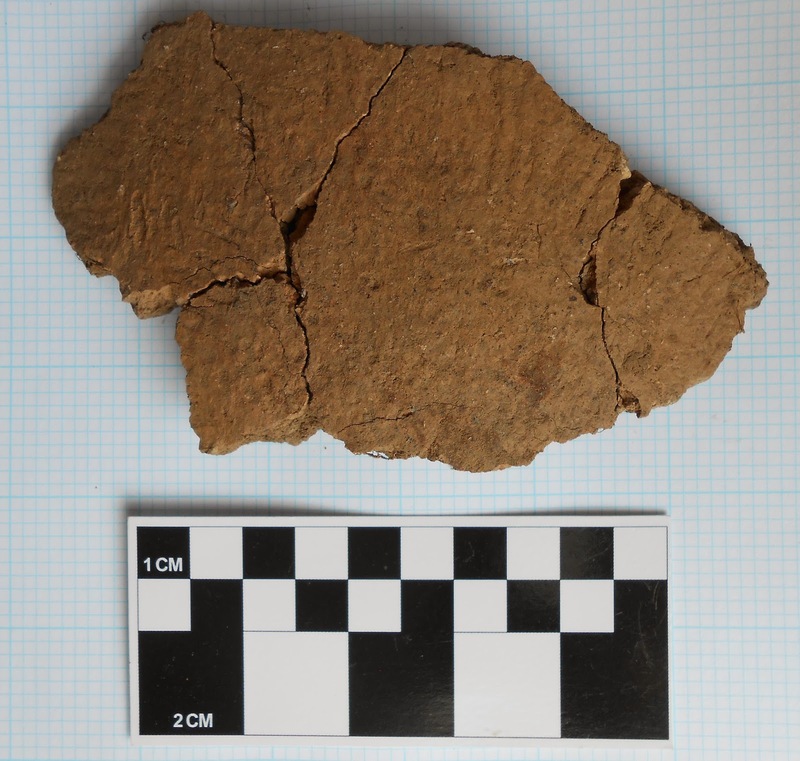 This sizeable remnant is a part of the lower "bowl" section of a ceramic vessel. Daniel worked carefully to remove the pot, keeping all the pieces together to aid reconstruction. It's our last week of excavations already... time sure flies. We will be running errands on Thursday, but today, Wednesday and Friday we will be digging 8:30-4. Saturday and Sunday are backfill days. 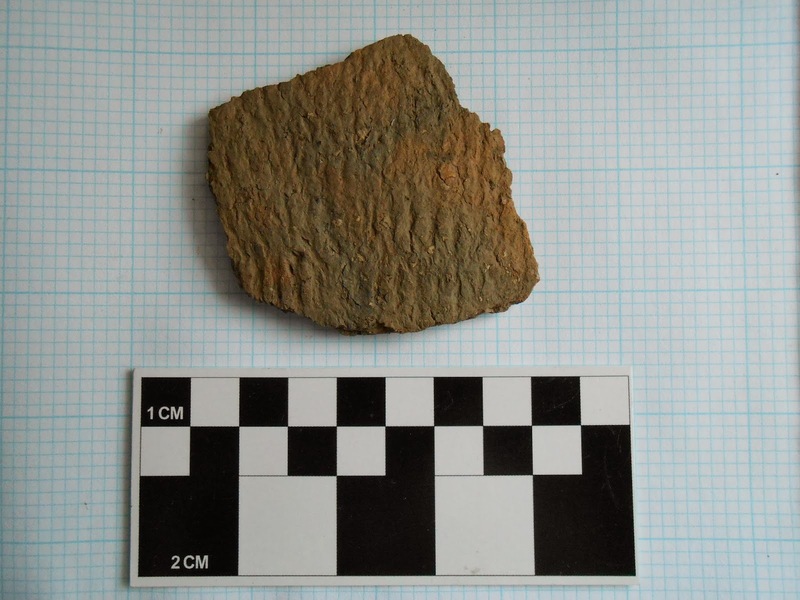 Feature 13-05 showed some promise, and then turned out to be filled with pottery, chert fragments and large chunks of charcoal. Cynthia and Jim had their hands full recording all of the data afforded by this shallow pit feature. The plow probably removed much of the upper portion, but enough remains for a nice dataset. Cynthia exposing FCR and large potsherds in Feature 13-05. Recording an artifact from Feature 13-05. At the base of level 2 in F 13-05, a large potsherd still pokes out of the next level. Note rodent burrows eminating to the north. Jill's "jackpot" from the plow zone above Feature 13-06. 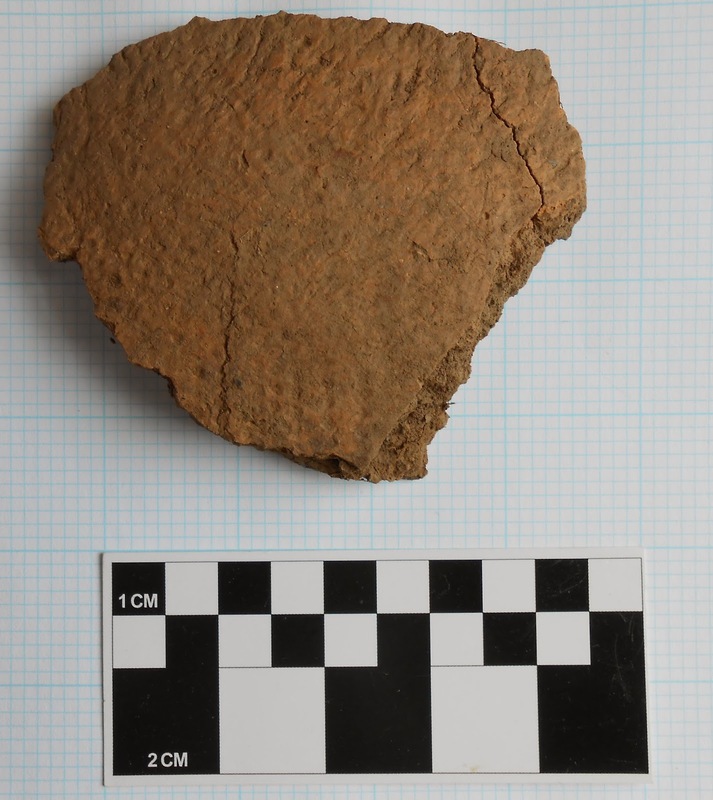 This rimsherd and several other fragments of the same pot are turning up at the base of a plow furrow. The sherds resemble sherds found on the surface a few years back (see the upper left corner of the photo of the 13 unique vessels from the surface surveys on the Bockmier Point and Bockmier 1 page). The design motif along the rim is called Middleport Crisscross. Area C has become a "hot spot" of activity, since two large features have appeared within the last few days. 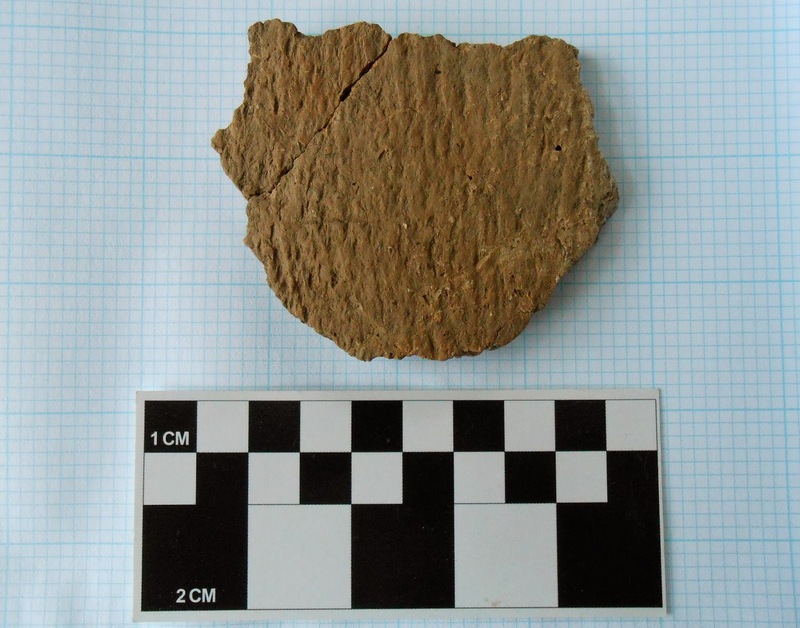 Features 13-05 and 13-06 appeared as large negative spikes on the gradiometer maps, and both have been hit by the plow a few times, pulling up large chunks of pottery. 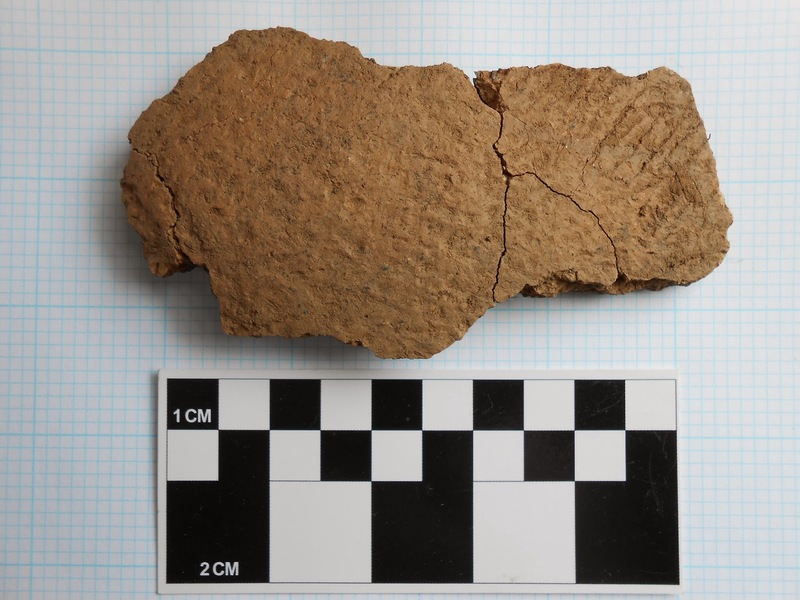 Our hope is that the majority of these features were left intact, and will yield subsistence information, like charred food remains and seeds. We are currently expanding units around the features, to get a plan view before cutting into them for profiles. Exciting work, so come on down to volunteer or just see what we're up to! The site t shirts are available! They are provided at cost ($10 each), but supporting members get a $5 discount. Come down and get yours! Don't forget to "like" us on Facebook! Volunteer Tim and Vision 2020 intern Caleb. As a part of the AVP experience, we will be attending the Pow-Wow in Salamanca this Saturday. We will be digging at the site today through Friday from 8-4, and all volunteers are welcome! We will be off on Monday, July 15, and will resume excavations the next day. Come out and join us! Jare Cardinal gave a wonderful tour at the Seneca-Iroquois National Museum for our interns and volunteers. Thanks Jare! We're back at the site 8-4 for the next several days, and we welcome local volunteers of all ages! Hope to see you soon! A portion of Area C (the target area) has been cleared and set into the grid. Peripheral units are being finished up, and soon we will all be excavating in the 'hotspot'. Hopefully, the anomalies will turn out to be data-rich, and we also hope that some postmolds have survived the deep plowing. Virginians and Texans have arrived. We still have plenty of room for local volunteers, as we have only two student interns. Remember to check us out and 'like' us on Facebook! Volunteers Laurie and Tom screening at Area A. Yesterday we were lucky enough to have a full workday without a drop of rain! We set up grid points from the 2007-2009 grid and used the gradiometer data from 2009 to choose a couple initial locations for test pits. Our first 1X1 is located over an anomaly at N258 E202, and we were nearly at the base of the plow zone before it finally began to rain. We will hopefully finish the plow zone level today, and map the base... and find out what the anomaly represents. 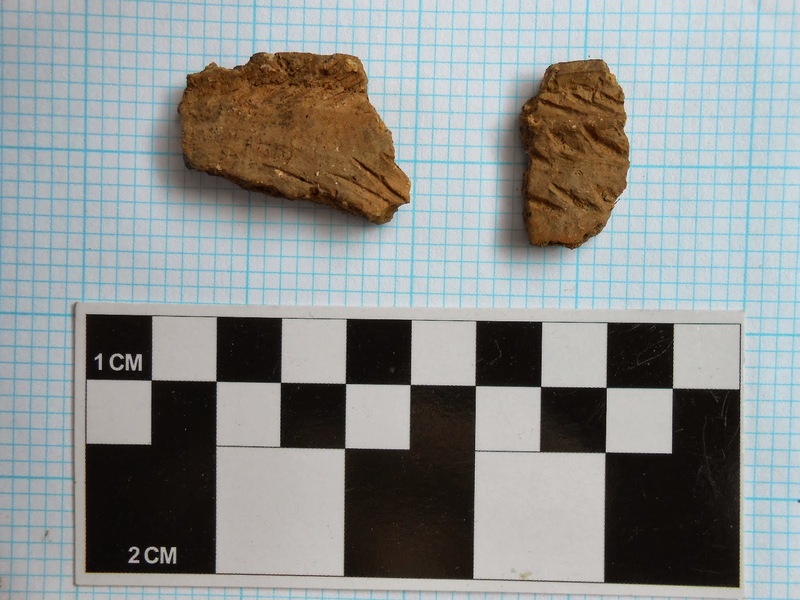 The test pit has so far yielded some flakes (clarence onondaga and huronian cherts) and a tiny fragment of weathered pottery. Mark, Kate and Julie from Canticle Farms have been wonderfully hospitable. Not only do we have a place to park, we also have access to the market building for lab space and the ever-important restroom facility. We will have to park off to the side of the building on Tuesdays and Fridays, when the farm market is open. For volunteers and visitors who may have a hard time walking to and from the excavation site, we can allow one or two vehicles to drive down in (please ask for the correct route before driving down in, as there are serious plow furrows on some of the lanes), if they agree to make bathroom runs from time to time. Unfortunately, this will only work on days when there is no rain, as it is easy to get stuck in the field when it's wet. Labs will generally be held on rain days other than Tuesday and Friday, and perhaps later in the season we can schedule a weekly lab day on Sunday or Wednesday (or both), for folks who want to help out, but may not want to spend the day in the field. Come on out to volunteer or visit! We're at the new Canticle Farms facility at 3809 Old State Road (formerly Bockmiers Market) in Allegany. If we get enough students enrolled, the field school will begin July 8. If not, there will be that much more room for volunteers! Field Season 2013 is nearly upon us! Funding for this season's equipment and supplies comes mainly from donations from A. Altenburg, J. Patton, T. Sherman and C. Isbrecht, as well as several supporting members. Though we have a field school scheduled, but there are still ample opportunities for volunteers to participate. This year, on non-field school days, walk-on volunteers are welcome. This includes the entire week prior to the field school and Saturdays and some Sundays thereafter (see calendar below). If you'd like to volunteer on a field school day, a limited number of positions are available for which to schedule in advance on a first-come-first-serve basis (days are filling up, so schedule as soon as possible). Email sph1@email.com or visit the site to schedule. It promises to be an exciting season! This blog will again serve as a communications window during the field season, with updates at least every few days. Any scheduling changes that may occur will also be posted here. 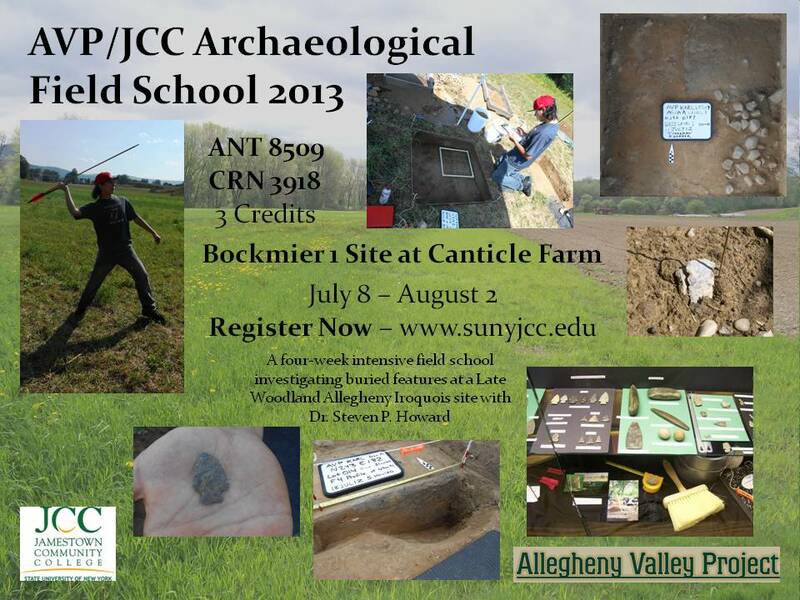 *The JCC field school requires a minimum number of registered students. If the minimum is not met, the field school will be cancelled. In that event, all registered students will be refunded their tuition fees through JCC. Any students that had registered and planned to attend the field school will be welcome to participate as unpaid AVP interns, to gain valuable field experience. In the event that the field school is cancelled, the project will be open to walk-on volunteers every working day. Tuition for the field school is $510 for in-state (NY) and $915 for out of state ($170/305 per credit hour respectively).